The growth of various cell types on plastic, soda lime glass and borosilicate coverglass were examined. The surfaces were either unmodified, coated with polylysine, or stably surface modified with non-biological reagents as described by Kleinfield, et al. (1988). 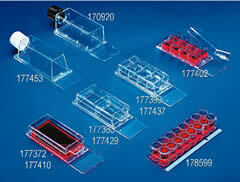 All substrates were assembled into Lab-Tek® and Lab-Tek®II Chamber Slide™ products. Lab-Tek® II Chamber Slide™ products offer optimal surface for excellent attachment and growth of cells, easily distinguished by the blue mark. This design allows for the removal of the media chamber and adhesive from the slide, using a separation device. The blue hydrophobic border is raised slightly and isolates the individual wells, and prevents cross contamination. The slide can be coversliped. 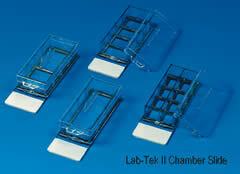 Lab-Tek® II CC2™ Chamber Slide™ products are the newest addition to our Lab-Tek® II Chamber Slide™ family. CC2 shares several similarities with the original Lab-Tek® II Chamber Slide, however, its pronounced difference is that the glass growth surface has been chemically modified. This modification provides an optimal surface for growing fastidious cells such as primary neurons or poorly adherent cell lines. CC2 also are non-auto fluorescent making them ideal for fluorescent applications such as FISH (Fluorescent in situ Hybridization). The growth surface remains stable without refrigeration. 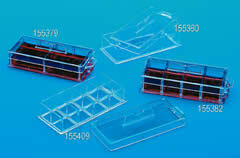 Lab-Tek® II and Lab-Tek II CC2™ Chamber Slide™ Systems all come packed in a sterile sealed tray. 8 units per tray, 2 trays per pack and 12 trays per case. Lab-Tek® and Lab-Tek®II Chambered Coverglass products are intended for high magnification examination of living cells using an inverted microscope. The growth surface of the Lab-Tek Chambered Coverglass products are #1 Borosilicate Coverglass from American origin. The Lab-Tek¨ II Chambered Coverglass products are #1.5 Borosilicate Coverglass of German origin. The thin glass growth surface allows optimal optical clarity when viewing living cells with high resolution of an inverted microscope. The media chambers are available in 1, 2, 4, and 8 well formats and cannot be removed from the coverglass surface. The Chambered Coverglass is provided sterile and ready to use.